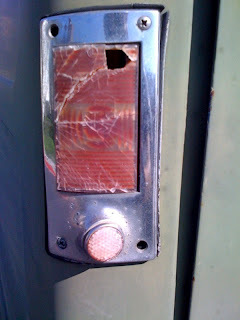 Riding over to my friend Graham's house on Sunday, i spied this rugged chunk o' American iron in his neighborhood. It's a Willys Jeep Wagon, arguably the first sport utility model produced. 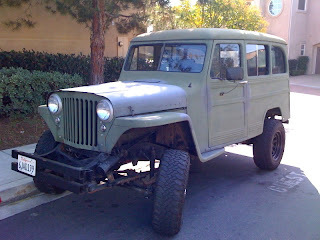 Designed by industrial design master Brooks Stevens and in production from 1946 - 1965, the Jeep Wagon (like the IH Scout posted a couple of weeks back) is a great example of a truck that is simply a truck. No soccer-mom "crossover" baubles like carpeting and, uh, windshield wipers. This is a man's truck. Simple and sturdy. 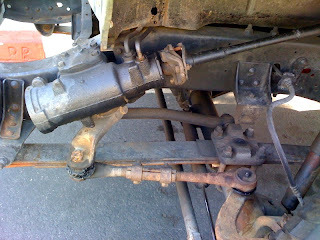 Bend a tie rod? Just bend it back, alignment-be-damned. 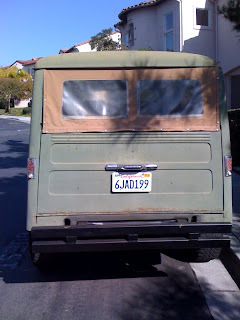 The fabric rear window is great for hauling longboards around. Just pop six snaps and throw your board in. Getting the job done for 45+ years. What more do you need?